Follow the procedure below if you cannot move the shift lever out of the position. 2. Remove the built-in key from the keyless access remote. 3. Wrap a cloth around the tip of a small flattip screwdriver and remove the cover of the shift lock release slot. - Put the tip of the flat-tip screwdriver into the slot and remove it as shown in the image. 4. 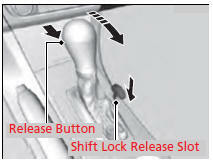 Insert the key into the shift lock release slot. 5. 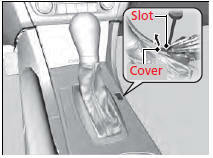 While pushing on the key, press the shift lever release button and place the shift lever into . - The lock is now released. Have the shift lever checked by a dealer as soon as possible.